MORI VOLVIA DE SU CLASE DE MUSICA POR EL CAMINO DE PIEDRAS DE COLORES QUE CONDUCIA A SU CASA. LE GUSTABA OBSERVAR LOS SERES INPERCEPTIBLES QUE SOLO ELLA PODIA VER CON SUS OJOS GRANDES Y CURIOSOS DEL COLOR DE LA INOCENCIA. RESPUESTA ALGUNA, SUJETÓ CON SU MANECILLA EL GORRO DE SU CABECITA Y COMENZO A CORRER HACIA LA EXTRAÑA LUZ..
DENTRO DE POCO COMENZARA EL VIAJE DE LOS SUEÑOS Y HOY TE TOCAN LOS MAS BONITOS. 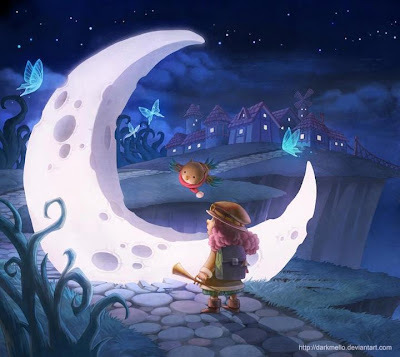 Y ASI FUE, MORI SE INTRODUJO POR UNO DE LOS AGUJEROS DE LA LUNA Y TUVO SUEÑOS MARAVILLOSOS ...COMO LOS QUE TENDREIS VOSOTROS ...FELIZ NOCHE.